If one price is good, two are better. If you are a regular reader of this blog or have read extensively about price discrimination, you see the merits of offering different versions at different price points. Apple has been a leader at practicing effective pricing, especially in its multi-version pricing aimed at maximizing profits. All major Apple products come in versions, but not AppleTV. It was not versioned before and it is not versioned in its current incarnation. Since AppleTV eliminated storage in AppleTV, there isn’t an option to do versioning based on the size of hard drive. So, did versioning simply skip their attention? Before answering this question, let us look at a very similar product from Roku. It offers three versions of the product, a base version at $60, a middle version at $7o and a “premium”version at $100. Has Roku done better segmentation of the customers and hence is able to target them with right versions? Roku’s version design appears less optimal, less strategic and more of a tactical one. Their base version does not support HD video and does not have HDMI output. How big is such a segment and what type of customers will prefer this model? Those with older TV models but have a need to stream Netflix and other web videos to their TV. While such segment exists, it is more likely that those who are technically savvy to seek Roku will most likely have or upgrade to a TV with HDMI input. Those that have new TVs but are price sensitive, which seems farfetched given their immediate purchasing behavior and their preferences. 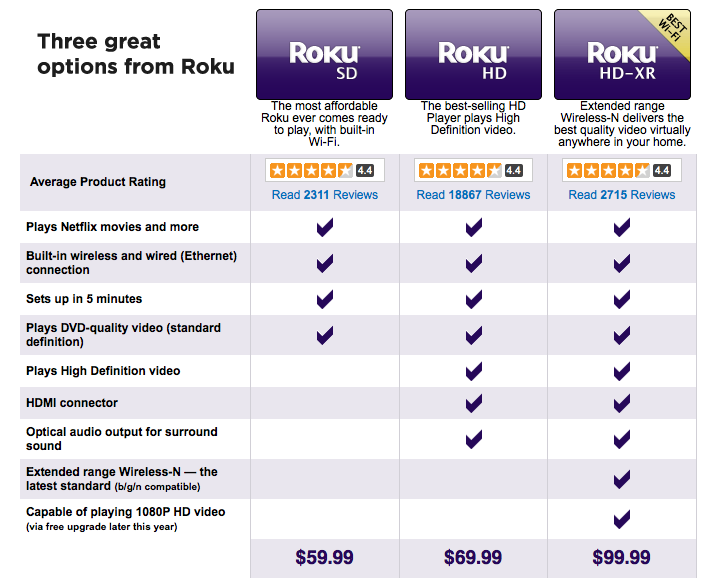 How big is the segment for Roku’s premium priced device? The biggest differentiators are Wireless-n and 1080p that is available later in the year. With Wifi (b and g) satisfying most customers and lack of enough Internet content in 1080p, again this segment is most likely really small. If we use the number of reviews as a stand-in for their sales volume (see here), we can see that the middle version sold 3.6 times more than the basic and premium version combined. Roku is mostly using versioning to nudge its customers to pick the middle version, given that it is not sold in stores and its customers do not have enough information to make an informed decision about the version to choose. Versioning works if there exists multiple segments with different benefit preferences or if the same customer is willing to trade-off benefits for price. It is likely that there is really only one segment, the one that prefers a box with HDMI output and delivers HD video. The base version without HD support adds no value to most customers at any price and beyond HD and Optical sound, the box adds no incremental value. In other words, we are seeing the value-step function. If there exist differences in customer preferences, neither Roku nor Apple has done enough work to find what the differences are. Apple may not consider AppleTV to be their next $1 Billion product and hence may be reluctant to invest enough research and marketing dollars behind it and Roku has an opportunity to do strategic versioning given this is their only product. How do you do your versioning?